Starting today and going through Sunday January 16th, Tomorrow Never Knows 2011 will be rocking Lincoln Hall, Schubas and Metro. Here’s the lowdown and some free downloads to get you ready for the show. Over 30 bands will play over the course of 5 days at three different venues. It’s going to be a great chance to see a wide variety of music spanning tunes flavored in rap, indie-rock, pop, drone, punk, and kid-friendly punk rock. Among our favorites picks are the Concretes, Rita J, Freddie Gibbs and the Besnard Lakes, just to name a few. You can buy five day passes for 75 bucks or check out the official site for individual day tickets for each venues and show on the Official Tomorrow Never Knows site. 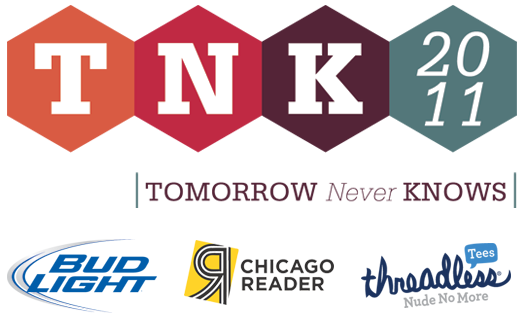 Here’s a few links to downloadable tunes from bands playing TNK 2011 via ChicagoNow and the Loup Loop Press Mixtape. If you’re planning on checking out the show we’d love to hear your story. Tell us all about it the comment below! Did The Concert Industry Survive 2010?